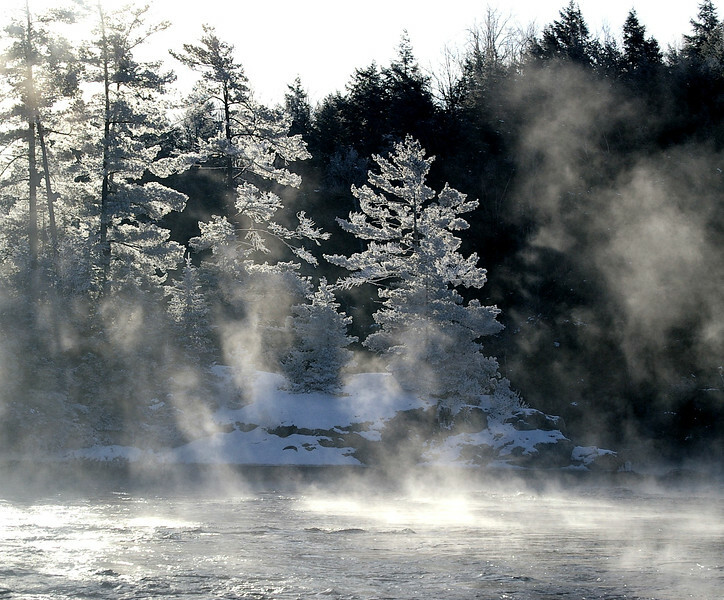 An extremely cold morning along the Madawaska River. Taken 12 years ago today, on Feb 26, 2005. I noticed this location one morning when I was driving to Calabogie Peaks for a school class trip. I volunteered as a parent supervisor on the ski days whenever possible, as it gave me skiing time with Matt, Alyssa & Tina. Made a mental note of the location, I would need a cold clear morning so the mist from the upstream rapids would freeze on the trees on the island, and then I could get the sun shooting through it. The forecast looked promising, and I was up well before sunrise and on site. Even though Calabogie was not on the way to work at all, I figured I could grab the shot, and get to work within a reasonable time (we had flex time, so being a bit late was ok). Little did I realize that it would take *much* later than sunrise for the sun to actually clear the trees in the background. I waited for over an hour at -30C along the river front, to get this shot. I was much later for work that day than I had expected.